This book describes the fascinating wealth of activities as they occur in the design, construction and commissioning of a chemical plant - a jigsaw puzzle of the work of chemical engineers, chemists, constructors, architects, electrical engineers, process automation engineers, economists and legal staff. The author first takes the reader through the conceptual phase, in which the economic relevance and environmental impact need to be considered and supplemented by accurate estimates of capital requirements and profitability. 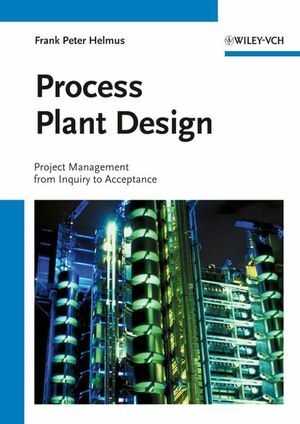 This phase ends with the choice of an appropriate engineering firm and the conclusion of the contract, after which the reader is guided through all aspects of the implementation phase from the engineering of the chemical plant to commissioning, equipment and material procurement, the erection phase and the successful test run, after which the new facility is handed over to its owner. The book also illustrates many potential sources of errors by means of examples from practice, and how, aside professional skills, teamwork and communication are also absolutely essential to keep such a complex project on track. Frank Peter Helmus studied chemical engineering in Aachen, Germany and obtained the PhD for his work on membrane processes. Afterwards he worked as a project manager in the Babcock Balcke-Dürr company. During his industrial career he carried out several medium sized projects (waste water treatment plants up to 18 million Euro), some of them abroad, as a project manager from the beginning to the end. Since 1998 he is professor for chemical engineering at the University of Applied Sciences in Osnabrück. His main field of activity is mechanical processes and process plant design. He is related to his former field of activities by performing claims management courses for senior engineers. His research activities focus on waste water treatment.